The German city of Wuppertal, according to statistics, is not included even in the top ten most popular tourist destinations in Germany. 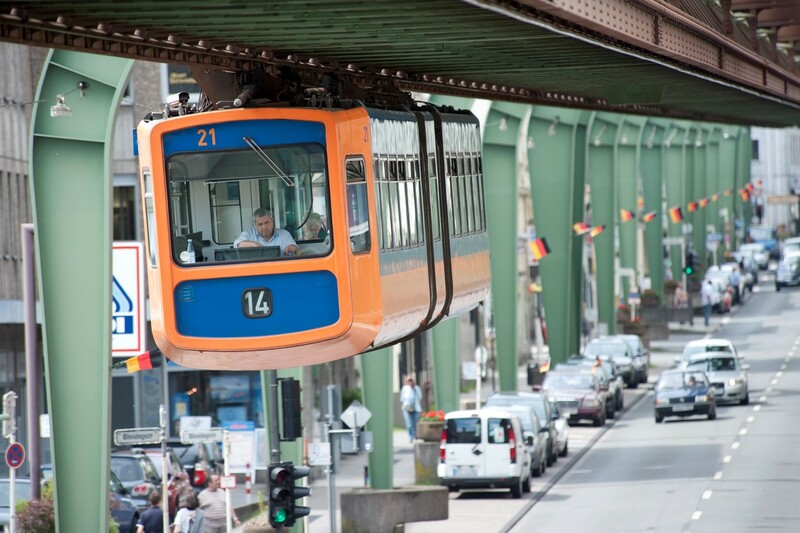 In addition to the legendary dancer Pina Bausch, the same-name football club and the world-famous film director Tom Tykwer, whose career began in city movie clubs, Wuppertal seems to have nothing to boast about, but as soon as you learn about local transport - the city with its unique suspension monorail, it becomes so coveted for travelers. 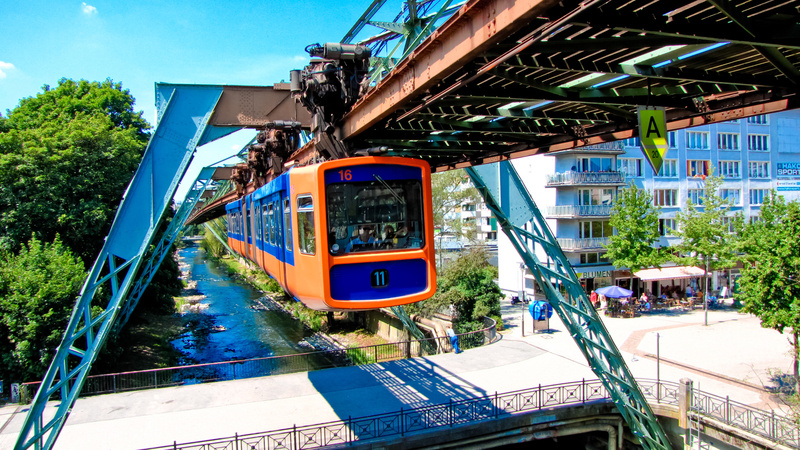 Located in the west of the country, in the urbanized region of North Rhine Westphalen, the industrial and 400-thousandth Wuppertal is now a classic western European city - modern, well maintained with a relatively quiet rhythm of life. In its current borders it was formed only in the 20th century, by merging several settlements that specialized in industry - coal, machine building, brewing and energy. No wonder this part of Germany is called the industrial heart of the country, stretching along the Rhine. The golden age of factories and factories in these parts was at the end of the twentieth century, when the population and the cities themselves grew at an incredible rate, turning from settlements around industrial objects to the megacities of that time. Wuppertal did not share this destiny as this fate in the 1890s it was bigger and more important strategically than, for example, Cologne or Dortmund, so the city transport became a serious issue for the authorities once the river Vupper flowing here made the communication between the districts quite difficult. Initially, the citizens waited for the subway, as because of the terrain and the remoteness of the areas from each other, the tram was problematic to stretch. Unfortunately, the geological reconnaissance proved that there is too much water in the ground, and the terrain itself is very rocky, so the only way out is to build such a half meter, half-tram, half train that will go ... in the air. Just say that the German engineers would not be German, if the fantastic project, which still amazes with its scale and flight of fantasy, would not be maximally thought out. Its author is Karl Eugen Langen, who headed the creative group. Unfortunately, he did not live quite a few years before the launch of his brainchild, although it was built in record time - in just two years from 1898 to 1900, when the transport was officially tested successfully by Kaiser Wilhelm II himself. 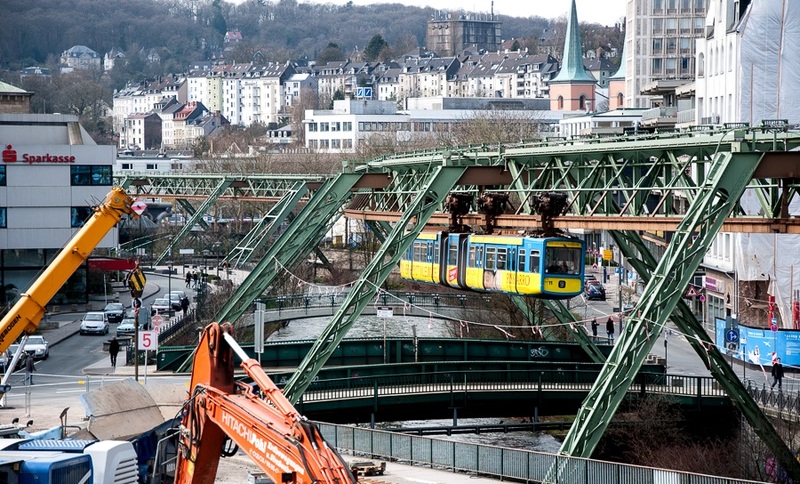 In the following year Wuppertaler Schwebebahn was open to everybody. 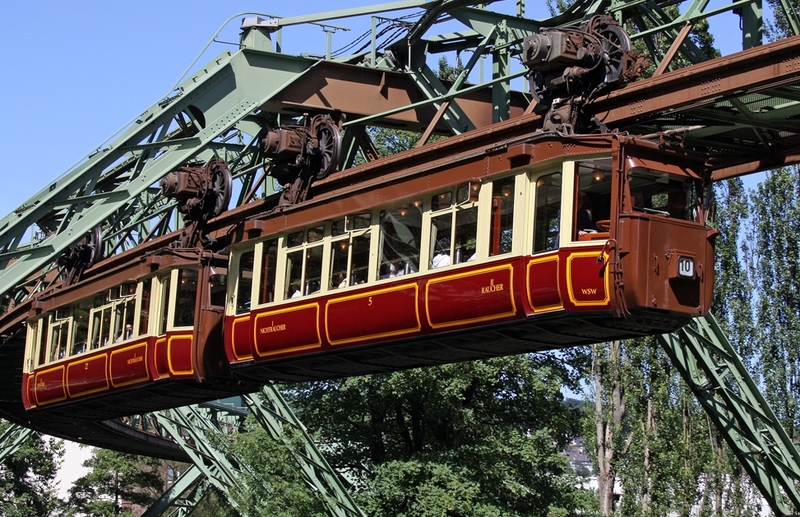 This cable road is the oldest active monorail in the world and unlike other "analogues" (similar one is in Dresden, as Langen also worked on its development), it performs today not a tourist function or "only lift", like funiculars, and full-fledged - transport. 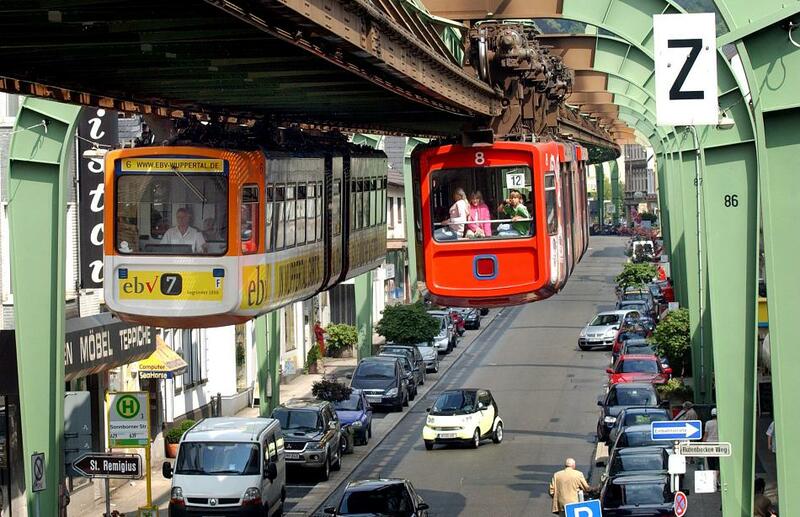 Annually, an air tram carries more than 25 million passengers, and this is in a city where the population does not even reach half a million. Wuppertalians simply adore their Shwebeban, because its line passes through the most important parts of the city and stretches for more than thirteen kilometers. The way itself, which passes both over the busy business center, the historic quarters of Barmen, and over the outlying districts, consists of twenty stations. Towards the platforms there are lifts or steps, delivering passengers to special platforms for landing. All the most technologically and safely - it's hard to believe, but the first serious incident here happened after almost one hundred years of continuous operation. In April 1999, one of the trains along the way jumped on forgotten construction claws, as a result of which the wagons collapsed into the river. The accident killed five people, more than forty were injured. According to the results of the investigation, it became obvious that the reason for the incident was the human factor, and not the problems with the transport itself. But again, after this inspection and modernization in Shvebeban began to pass more and more and today's updated trains and security systems reduce risks to a minimum, and the tramway is used even more actively - it is included in all world tops, with regard to safety in the public transport. What is interesting, the Wuppertal people saw another terrifying event connected with their cable road, but, fortunately, no one was hurt. On July 21st, 1950, the ambitious circus director Franz Altofoch decided, in the framework of an advertising campaign, to ride on Shwebeban ... an elephant from his circus and thus invite the townspeople to a performance. He rented a car, where the animal was planted, but only Tuffy - that's the name of the elephant, transport was not appreciated, and on the way between the stations "Alter Markt" and "Adlerbrücke" fell out of the car directly into the river from about 12 meters high. Tuffy plunged into the water successfully - he received no injuries or serious injuries, but the director had to justify himself from the animal defenders. The fact of the falling large animal inspired local artists to paint a picture on one of the houses nearby, but as for the photos - almost all of them, according to experts – represent photomontage, since nobody had time to shoot the moment of "fallout", but on the Internet there are a lot of photos. - The ticket price for an adult is 2.80 euro, for children it is 1.60 euro. - The journey time on the whole line is 28 minutes. The average speed of trains is 30 kilometers per hour, the maximum speed is just over sixty. - The platforms at the stations differ from the traditional ones for the underground, since their width is only three meters, but the length is more than twenty. - The average height of Shwebeban over the river is twelve meters, over the city streets it is eight. - The rolling stock is usually designed for transportation of 178 people, while only 48 have seats. - During twentieth century cars were produced by a well-known German company MAN, but in our time, a gradual transition to the Spanish cars designed in Valencia. 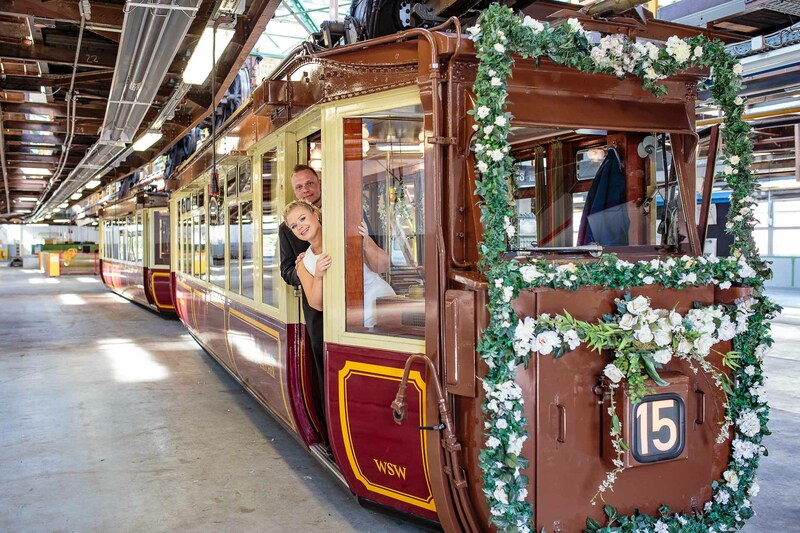 - The local just-married couples have a tradition to rent one of the "Kaiserskie compounds" preserved in the depot of the very beginning of the twentieth century and arrange a part of the celebration right there during the trip. Wooden textures, antique seats and rarities are perfectly preserved thanks to careful care, so the atmosphere during the trip is unforgettable, especially if you do not look down on the modern city, but consider the bends of the river, the roofs of cathedrals and the town hall. - The Wuppertal pendant road worked and even avoided serious damage in the early years of the Second World War. Only closer to the defeat of Germany and because of the increased bombardment, it was decided to close it. She resumed work in 1946, by that time finally becoming one of the symbols of the whole country. It is difficult to count all the films, wherever it was captured or the number of souvenirs with its image sold to tourists.